My thoughts the other day on the World Wildlife Fund’s jungle remedies prompted me to talk about natural products chemistry a bit. It’s an area that a lot of people have heard about, but not many people outside the field know what goes on there. There aren’t as many natural products research groups as there used to be, although there are enough of them to support a journal or two. That’s partly because it’s not considered the most cutting-edge sort of work any more, which is a bit of a shame, since there are surely still many useful compounds waiting to be discovered. But another reason not as many people work in the area is that so many compounds have already been found. If you go pick out a random organism and start searching, in most of the cases, most of the things you find are molecules that have already been characterized. The unusual compounds are down in the trace constituents, more often than not. You have a better chance for novelty if you pick the more exotic specimens, and organisms from highly competitive ecologies are the place to look. They’re the ones that find it useful to spend more metabolic energy on chemical defenses. It’s no surprise that there are so many interesting compounds from marine organisms, or terrestrial tropical ones. You’re less likely to find a wonder drug in an arctic lichen, partly because arctic lichens have their biochemistry pretty well spoken for just in staying alive. All the common molecules of life, your regular lipids and amino acids and carbohydrates, are suitable food for other organisms. If a creature is devoting some of its metabolism to keep from being bothered, though, it’s going to need to make something a little more interesting. This explains why the traditional strongholds of natural products as drugs are in the antibacterial/antifungal areas, and in cancer therapies. Those are the main uses that humans have for medicinal compounds that work by killing or injuring cells. These chemical defense compounds have been under evolutionary pressure for biological activity in other living things, so drug-hunting in this area is a lot different from screening a combichem library of semi-random compounds. The famous natural product drugs – the taxanes, vinblastines, penicillins, quinines, and erythromycins of the world – hit specific biochemical targets like the ones the synthetic molecules are aimed at. They’ve had untold millions of years of optimization, and what we see are the variants that have been best at keeping other bacteria away, for example, or keeping insects from stripping the leaves. It’s often impossible to improve on the potency of a natural product for its target. The best chances for that are when you can optimize for the human forms of the enzyme or receptor that the compounds are hitting, as opposed to the ones its been honing itself against all these years, or to improve its characteristics in the human digestive and circulatory system, which it probably also hasn’t been under pressure to do anything about. In the old days, extracting things from natural sources was a real black art, and it hasn’t completely lost that aspect. There are all sorts of standard schemes that people use when they’re looking at some new ground-up root or the like – extract with this solvent mixture, take what’s soluble over down this pathway, take the insoluble stuff and do this other thing with it, and so on. These things used to go on for pages and pages, but modern instrumentation (HPLC-mass spec, especially) has made analysis of brutal mixtures a lot faster and more thorough. And without modern instrumentation (NMR, especially), characterizing what you’d found could take months or years. That was one of the traditional reasons for total synthesis, since in many cases that was the only way to be really sure that a structure had been assigned properly. You’d take the real stuff and carefully break it apart, trying to work out what the fragments were and how they must have been connected, and the synthesis folks would attack the problem the other way around, building the molecule up from hand-made pieces. The heroic age of this kind of chemistry lasted up through the 1960s. And natural products are still the target of the great majority of syntheses. They show all kinds of challenging complexities (crazy combinations of functional groups, dense and knotty stereochemistry, wild fused ring systems, and so on). 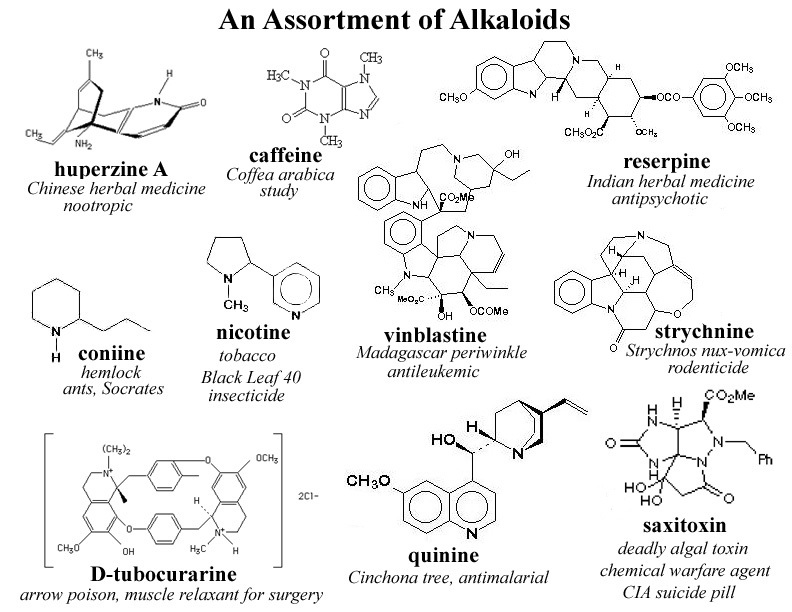 Here are some marine toxins to give you an idea, and here are some plant-derived alkaloids. These are only the beginning – there are some really ridiculous structures out there. So, what happens when you discover that some crazy compound from the Nibi-Nibi sea cucumber looks like a great lead against some dread disease? That’ll be the subject of the next post in this series. For now, here are the pages for a couple of very well-known natural products chemists in academia, Jon Clardy and Jerry Meinwald. That’ll give you a good take on what the field is up to these days. Update: more worthy lab sites in the comments. Thanks, Derek, for drawing attention to an important area of drug development that is all too often thought of as old science. Dr Clardy is a friendly and accomplished competitor but I would like to add Nick Oberlies to the list of chemists your readers might care to know. Nick is at a non-profit research institute called RTI International, known previously as Research Triangle Institute, where the isolation and structural elucidation of both Taxol and camptothecin were accomplished by the late Monroe Wall and still-active Mansukh Wani. (And Wani solved Taxol using a 40MHz NMR – yes, forty). ACS awarded them National Historic Chemical Landmark status in 2003. Dr Oberlies is bringing the next generation of this group into the study of other organisms as drug sources. Together with my own NCI support, he is also sifting among herbal medicines and dietary supplements for useful compounds that may have been overlooked. With the Human Genome Project and other large scale efforts revealing a host of new drug targets, natural products provide a level of chemical diversity to at least begin to generate leads. Pharma has viewed natural products as having a supply/synthesis barrier, but Holton’s semisynthesis of Taxol and BMS’s more recent ixabepilone are just two examples that give me great faith in the continued riches that lie in natural products. Thanks for giving a voice to this oft-overlooked field. Great post but I have to argue with the point, “not as many people work in the area is that so many compounds have already been found.” Less people become “natural product” chemists because it has been devalued, harder to get funding, in some ways “replaced by cheaper ways of generating chemical diversity”, which, of course has been shown not to be true. We have barely looked at microorganisms and much will be found in the future. Add to that advances in culturing the “unculturables” and genetic analysis that has shown that microorganisms express only a fraction of the proteins within their genome that make natural products, and many more interesting structures will be found. If more people know about these things, maybe there will be a reinvestment in the field. It always amazes me how diverse and potentially active natural products are. Considering the incresed level of interest in marine natural products that has been seen in the past 10 years, I can only hope that the “bounty of the sea” gives us some really good therapeutics. It is ashame that there is not a lot of funding for this kind of work. Iâ€™ve heard rumors that some big pharmaceutical companies (who minimized or abandoned their natural products divisions years ago) were thinking about bringing them back… Can anyone comment on whether or not this is true? And I would also add William Fenical to your list of “well-known natural products chemists in academia” – I saw him talk at the ACS conference recently and was really impressed with his recent work… Those Salinispora produce some strange natural products (see here, here, and here). Great article! This brings back fond memories of my stint as a lab tech between undergrad and grad school. I tested sea critter extracts for biological activity in support the late Ken Rinehart’s lab, and ground up sea cucumbers on occasion. By 1961, University of Hawaii researchers interested in local natural products had discovered Malo’s writings about a Hawaiian spear poison, Limu Make O Hana. Only a few Maui natives remained who knew where the Limu Make O Hana grew, but none would tell. Finally, after drinking enough Okole Maluna (a local brew from the ti plant), one of them led the scientists to the sacred tide pool. As the biologists prepared to take specimens, a group of natives interrupted them. These announced that by an ancient cures the pond was “kapu”, and warned that if anything was disturbed, the evil of the curse would be activated. Smiling, the scientists said, “We don’t believe in superstition”, and took their samples. Coincidentally, on that same day a fire destroyed the main laboratory building of the Hawaiian Institute of Marine Biology on Coconut Island in Kaneohe Bay, Oahu. The anenome samples taken, proved to be a new species, which was named Palythoa toxica* and contained the deadly poison, palytoxin. I don’t think anything untoward occurred when Kishi’s lab synthesized that beast. Joshua, yes, the comeback of natural products, or at least adding examples of such to decks in the interest of chemical diversity, is true. My big pharma employer is exploring this approach. I take your point about the higher likelihood of finding promising leads in organisms from competitive environments, but we shouldn’t neglect more mundane ones either. Remember that taxol was isolated from the Pacific Yew which grows in the temperate rain forests of the Pacific Northwest. Seems like drug candidates, like gold, are where you find them. Screen our Newly Isolated compound library to generate new drug leads. Please take a look at our unique sample library containing low hanging fruits, and consider screening it in your next drug lead discovery. We (usahealthresource.com) provide over 12,000 non-commercially available compounds and fractions obtained by column separation of worldwide chemically untapped natural products.